For the past week, open wheel racing drivers and teams have been lapping the Indianapolis Motor Speedway in order to find the key to winning the 96th Indianapolis 500 on Memorial Day Sunday. This year's Indy 500 practice was more important than it has been in years at the 2.5-mile speedway oval with brand new Dallara DW12 chassis race cars and turbocharged engines set for their first Month of May. 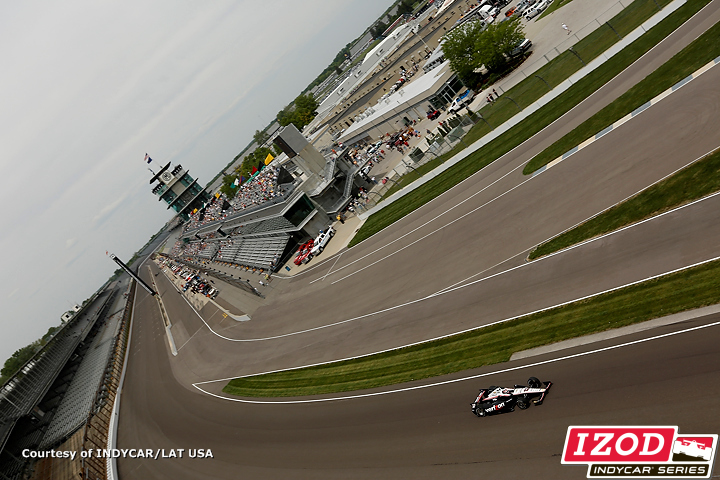 Through the course of the week, average speeds at the Indianapolis Motor Speedway crept over 223 miles per hour. Slower than the 2011 cars, there was some disappointment that the 2012 contenders at the track were not up to the same pace as last year. For "Fast Friday" practice, the INDYCAR sanctioning body permitted teams to increase the turbo boost pressure by 10 kPa which allowed the V-6 engines to produce around 40 horsepower extra. Because of the additional power, 32 of the 33 active drivers in practice posted their best track times for the Friday practice session. 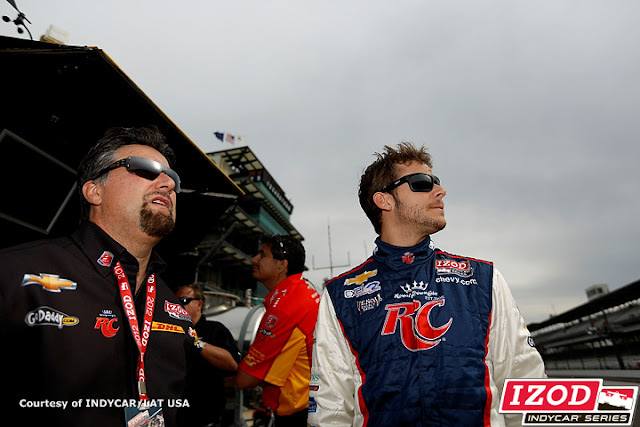 For what proved to be the highest speeds recorded at the Indianapolis Motor Speedway, the fastest one-lap run was posted by Andretti Autosport driver Marco Andretti. Jetting around the 2.5-mile oval in 39.5535 seconds, Andretti's "Fast Friday" effort equates to an average speed of 227.540 miles per hour. Over a tenth of a second slower than the #26 of Marco Andretti, Team Penske's #2 car of Ryan Briscoe recorded a 226.835-mile per hour average speed. With Helio Castroneves and Ryan Hunter-Reay behind Briscoe on the time sheet, the the top-four fastest times were all set by Chevrolet-powered cars. In the entire top-10, Chevrolet's surge for Indy 500 Pole Day success is solidifed by the 8 IZOD INDYCAR DW12 Dallaras powered by the Bowtie brand. The leading Honda-engined car after "Fast Friday" is the #9 Target Chip Ganassi Racing car driven by Scott Dixon who posted a 226.224-mile per hour speed around the 2.5-mile oval. Dixon's teammate Dario Franchitti was the second Honda runner in the top-10 placing 9th fastest on Friday. For the first time since 2005, the Indy 500 will be contended by more than a single engine brand. With Chevrolet, Honda and Lotus supplying powerplants for the 2012 Indy 500 race, the week preparing for Pole Day resulted in Chevrolet and Honda strengthening their numbers as a result of the ailing situations with Lotus' INDYCAR program. On Wednesday, Dragon Racing was finally approved to install Chevrolet engines into their team cars driven by Sebastien Bourdais and Katherine Legge. The engine politics played havoc with Legge's Rookie Orientation. The two remaining Lotus engined Dallara DW12 race cars are buried at the bottom time chart. Nudging a lap above 213 miles per hour, former Formula 1 driver Jean Alesi was 2.5 seconds slower than Marco Andretti's fastest time. 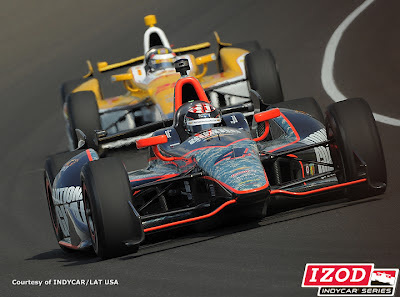 The slowest driver over the course of 7 practice sessions was Simona de Silvestro who is still struggling to find speed with he HVM Racing team during the 2012 IZOD INDYCAR Series season. Indy 500 Pole Day is set for tomorrow with a qualifying draw settling the order that cars position themselves for a four-lap time trial run. Saturday's qualifying at the Indianapolis Motor Speedway will determine the top 24 spots of the 2012 Memorial Day race. Consisting of two segments, the top nine fastest cars on Saturday will advance to a final qualifying session. The following list of speeds at the Indianapolis Motor Speedway is the top runs of the 33 drivers at the track. It is not unusual that additional competitors may be posting times either on Saturday's Pole Day or Sunday's Bump Day.